It's been 9 weeks now since the start of 8 Weeks to a Better Me, and I've absolutely enjoyed setting small goals and (mostly) achieving them! Some of the goals I set have actually become a part of my daily life/routine, and I think that's pretty awesome. I thought it would be great to recap each of the weeks and break down how I did! So, last night I began doing so (it took me two hours with little flashes of internet window shopping)...hit publish, and blogger gave me an error message...and wouldn't let me go back. I logged in this morning hoping it had saved, but alas, it did not. I believe one of my goals was not to waste my time (if it wasn't it is now), so I am refusing to retype, relink, and rethink all of it! What I will say though, is how much I truly enjoyed this project, and perhaps I'll bring it back closer to the new year with fresh topics and ideas! I also wanted to say thank you one more time to all of my fabulously inspiring contributors and super supportive (and equally inspiring) readers. I love you guys! p.s. 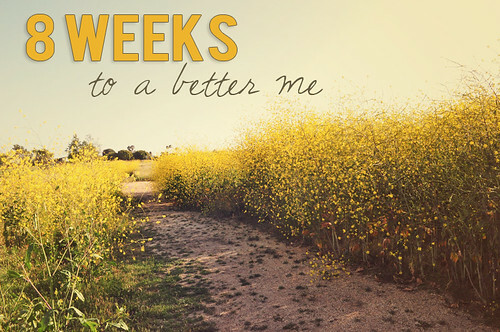 if you'd like to go back and read through each of the weeks, click the "8 weeks to a better me" tag below! This was a truly inspiring feature and I loved reading it so much!!!! I really hope you do a round two!! While I wasn't on top of things enough to play along week-by-week, I did take special note of some features and re-visited them when I had a moment. I usually can't follow through on goals to save my life, but I found it simple and easy to stick to three specific goals each week, with a specific theme in mind. I hope you do revisit this series again...it was so wonderful! On another note...I just finished the first book of the Hunger Games series and am officially hooked! Thanks for the recommendation! Book #2 made it on to my Kindle app last night and I can't wait to get started!! i really enjoyed this feature too! i set a lot of small goals for myself and some of them are a part of my daily life. too bad blogger messed up your post--i would have loved to read it! so sad! was definitely looking forward to reading yours and other's recaps... BUT, I definitely agree. Waste of time to type that all up again! It's time consuming. And you have a handsome little man tumbling around to occupy your time :) I will be posting my recap soon! I have it pretty much all typed up! Loved following along with this. It was so fun to watch you accomplish these little goals. It's awesome some of your goals have become daily habits now; some of mine have too and it's a good feeling. I just wish some of the others have stuck. This project was so fun and I just want to say thanks for creating it, Dani. It's been great and you rock! It's even caused me to continue making weekly goals and sharing them on the blog, mainly because I wanted to complete the ones I made for '8 weeks' that I didn't do first time round. My recap post is here. Oh no! I was really looking forward to reading the recap :( I've loved this series (and the rest of your blog). I can understand why you're letting it go, even though I still want to read it! Pretty good one..i really enjoyed this feature too!I would have loved to read it!